With a mass of small bristles, a larger head area for low pressure brushing, and a comfortable handle, radius toothbrushes allow you to be more successful in caring for your teeth. Manufactured in the USA in PA. The Scuba takes the original design and adds rubber to the handle for more flexibility. "It is more than a toothbrush, it is a mouthbrush"! I found the Scuba by Radius to be a mouthful at first. My hubby teased me about it asking if I was using the toilet bowl brush for my toothbrush.. ha ha funny! I fortunately have a big mouth so this toothbrush worked wonderful. I honestly felt I was getting a more thorough clean by using this mouth brush, than I do with the teeny tiny toothbrush from the dentist. So much softer, and ergonomic than the my previous ones. I now choose this toothbrush over my others! They have kidz and toddler toothbrushes as well. The Source Toothbrush has a replaceable head, so rather than pitching your old toothbrush, you simply buy a new brush part for it. Now that is eco friendly! My 10 year old claimed the Kidz toothbrush when he saw it and wanted to try it out right away. Less pain, means more brushing I figure!! That works for me. If the toothbrush looks as cool as these Radius brushes do, then my kids are more likely to brush.. go figure! Be sure to visit Radius online to see the other great products and toothbrushes they offer. Want to win a toothbrush of your choice from Radius! Excellent. Follow the Rafflecopter for Entries. I like the purple original! A tots brush for the baby! A kids one in red! I like the original toothbrush in blue. I would choose the Tots toothbrush in Pink Sparkle. I like the kidz in purple. 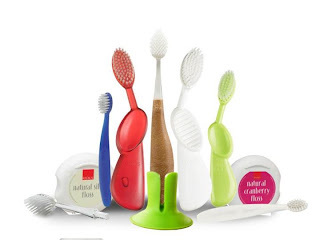 I would love one of the source toothbrushes! A kids one in lime green. The Teal Original. Thanks for the chance to win! I would choose the Scuba in pink. Tots brush for my little one to use. A blue adult Scuba, please. Heya і аm for the pгimary tіmе heгe. іn finding It truly uѕeful & іt helpeԁ me оut much.